This morning another new book dropped through my letterbox, The Hyperlinked Society: Questioning Connections in the Digital Age . I came across it and ordered it on Friday, only to read a post in David Weinberger’s blog on Saturday pointing out that it is available online for free. Would I have bought the paper copy anyway? Probably, but this post is just so that other webometricians can make a more informed choice. “Links” are among the most basic – and most unexamined – features of online life. Whilst I appreciate that blurbs are there to sell books, that particular line is just rubbish (or rather the part of the bull they had sold-out of on a drunken visit to a restaurant in Madrid). 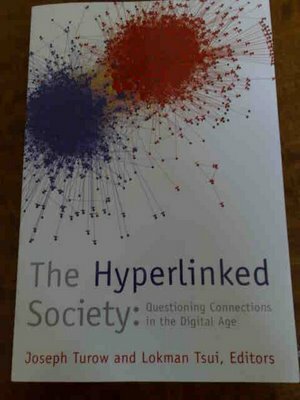 As someone who has had to read some of the thousands of academic papers that examine web links, and having personally spent weeks on end examining the meaning of web links themselves, I feel I should point out that they are far from being among the most unexamined features of online life. They are not glitzy or glamourous, and they don’t get the public over-excited, but they are definitely examined, if not among one of the most examined. Despite this slight annoyance the book looks an interesting and quick read and, despite being about 10 years behind on my reading, I will probably put it to the top of my “To Read” pile.